These professional, digital, UHF wireless systems are intended to provide reliable RF reception and clear audio suited to single or multi-channel use in applications such as touring, broadcast, theatre, conferences or presentations. All receivers and transmitters share a wide bandwidth of 470 - 636MHz, so the Axient Digital series can be transported from location to location, re-tuning to country or area-specific bands without the need for country-specific hardware - particularly useful for touring. Redundancy is also a main feature of the Axient Digital series, offering the facility of redundant RF, DANTE and audio output. Redundant power is available via an optional DC power module factory installed at time of order. The audio signal is converted from analogue to digital, so no compression, EQ, or other processing is required in preparation to transmit the audio with a flat frequency response of 20Hz-20kHz before two identical signals are transmitted on independent frequencies. The AD4D or AD4Q receiver can then switch between the two frequencies to retain the best signal and therefore the best audio quality. When switching between the two frequencies, the Axient system samples the last received data on the first frequency to ensure a seamless change. A standard transmission mode results in a latency of 2ms from transmitter to receiver analogue output. A high-density mode returns a latency of 2.9ms. AES (Advanced Encryption Standard) 256-bit technology is also employed to ensure the transmission signal is secure. Frequency band: 470-636 MHz (G56). The AD4D is a 1U rack-mounting, dual receiver that employs digital technology and true digital diversity to ensure high quality audio with a much reduced level of drop-out. Analogue audio outputs include independent balanced 3-pin XLRs with a dynamic range of over 120dB (A-Weighted, system gain +10), and a 3-pole, 6.35mm, jack output. Onboard digital outputs include AES3 and DANTE with a dynamic range of over 130dB (A-Weighted, system gain +10). The rear facing panel of the AD4D houses an AC main input socket (IEC inlet) and an AC power output socket to link to a second receiver. This link socket can be exchanged for an optional DC power input for redundancy at point of order (1). A 4-port DANTE switch is situated to the left, offering four RJ45 connectors. The switch can be configured for use with control and audio, or separate streams with redundancy. Word clock in and out connectors have an adjacent termination switch. A single AES3 output carries the digital output of channels one and two audio, whilst each channel also has a dedicated 3-pin XLR output as well as 6.35mm 3-pole jack output. Line/microphone and ground lift switches are available for each analogue output. On the far right there are four BNC connectors. Channels A and B can be connected to antennas for RF reception; connectors C and D can be used to cascade the RF signal to additional receivers. The front facing side has a 6.35mm jack, with associated rotary volume control, for the headphone output, 'enables DANTE Cue and DANTE Browse monitoring'. Two groups of indicators and controls are associated with channels one and two. Each has a six-stage LED meter for RF channel A and B and blue LEDs show the functionality of channel A and B. An eight-stage LED meter monitors the audio level being received. A large display screen shows a host of performance feedback including a 'channel quality' meter (RF signal to noise ratio), channel gain, transmitter battery life, RF channel and frequency. There are four function keys to the right of the screen that give quick access to the menu shown on the screen whilst a large, rotary, control knob and enter/exit buttons help to navigate the user-definable settings available. A power switch is positioned to the far right of the front panel. Rack mount fittings are not removable. Note (1): The optional redundant power facility must be requested at time of order and may incur additional lead time. The IEC power link output is standard. AD4DNP: This is the receiver only. The AD4Q receiver has the same functionality as the AD4D receiver but offers four reception channels. The receiver can be linked to two antenna for normal operation, or four antenna for 'Quadversity' mode, in which four remote antenna can be connected for optimum reception and much reduced drop out. This is particularly useful for operation within stadia or theatres where line-of-sight reception is not applicable, but also effective for multi-room broadcast operating from a central control hub such as in hotel presentation rooms or houses of worship. When running in 'Quadversity' mode, the BNC connectors usually used for cascading are used instead for the two additional remote antenna. Each channel has a dedicated, balanced, 3-pin, XLR output and 6.35mm 3-pole jack output. However, if the AES3 outputs for channels 1 and 2 are used, they appear on the XLR output for channel 3, leaving only the jack output for the channel 3 analogue output. Likewise, the XLR output for channel 4 is utilised for the AES3 outputs of channels 3 and 4, so only the jack output is available for the analogue output of channel 4. AD4QNP: This is the receiver only. AD4QUK: This includes an accessory pack with IEC power cable, manual, 1x network cable, 2x BNC cables, 2x BNC bulkhead adapter, 2x 'twig' antenna. 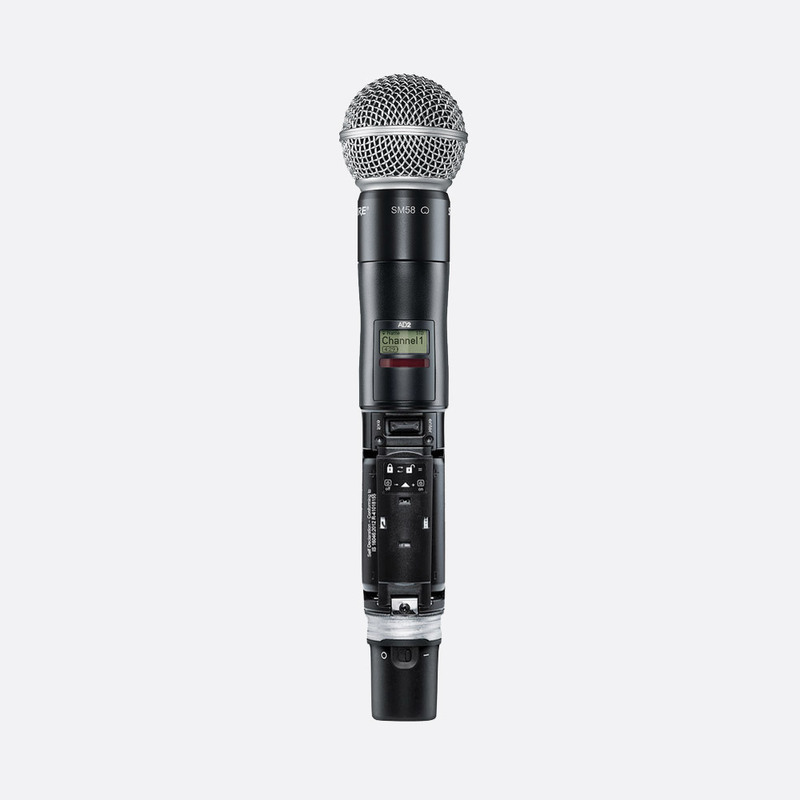 The AD2 is manufactured from metal for durability and offers interchangeable microphone capsules including SM58, BETA58a, KSM8 nickel or black, KSM9 nickel or black, KMS9HS nickel or black, BETA87a, BETA87c, and VP68. It can transmit audio over a frequency range of 20Hz to 20kHz with flat response, but each microphone capsule offers a different frequency response curve. It can be used with 2x AA alkaline batteries or an SB900A Lithium-ion rechargeable battery for up to nine hours operation. It offers external charging contacts for docked charging with an optional SBC200 or SBC800 battery charger. Like the AD1, the AD2 offers AES 256-bit encryption for signal privacy. A backlit LCD screen displays group/channel, frequency or battery life, while frequency and power-lockout functions are accessible by navigating the user menu. 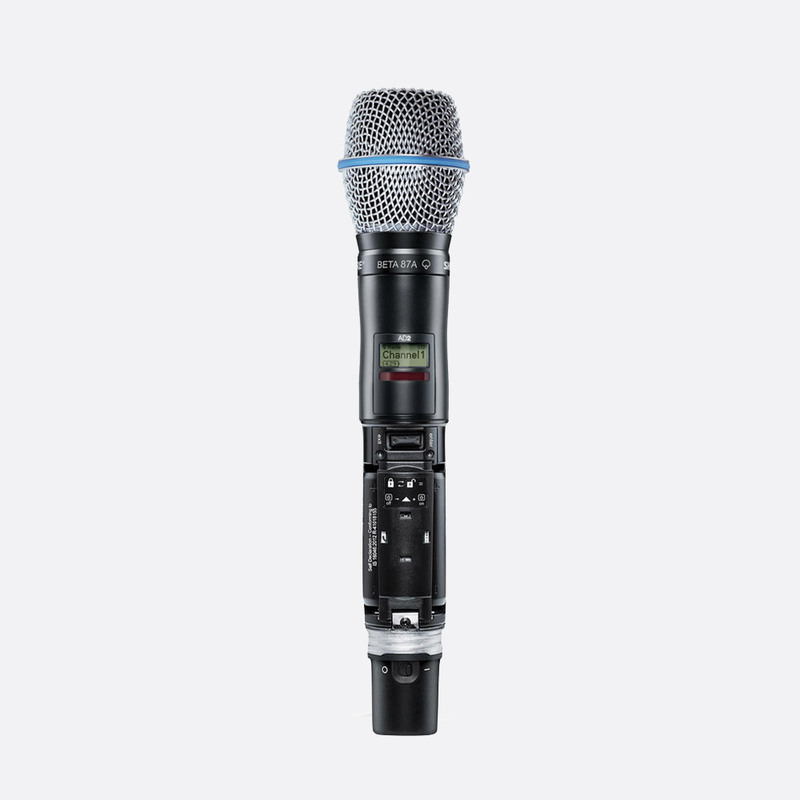 A low-profile, lockable, power switch is positioned on antenna section of the microphone. Shure microphone clamps are supplied as standard with a 5/8 inch thread. Thread adapters, 5/8 inch to 3/8 inch, are available separately (stock code 53-217). 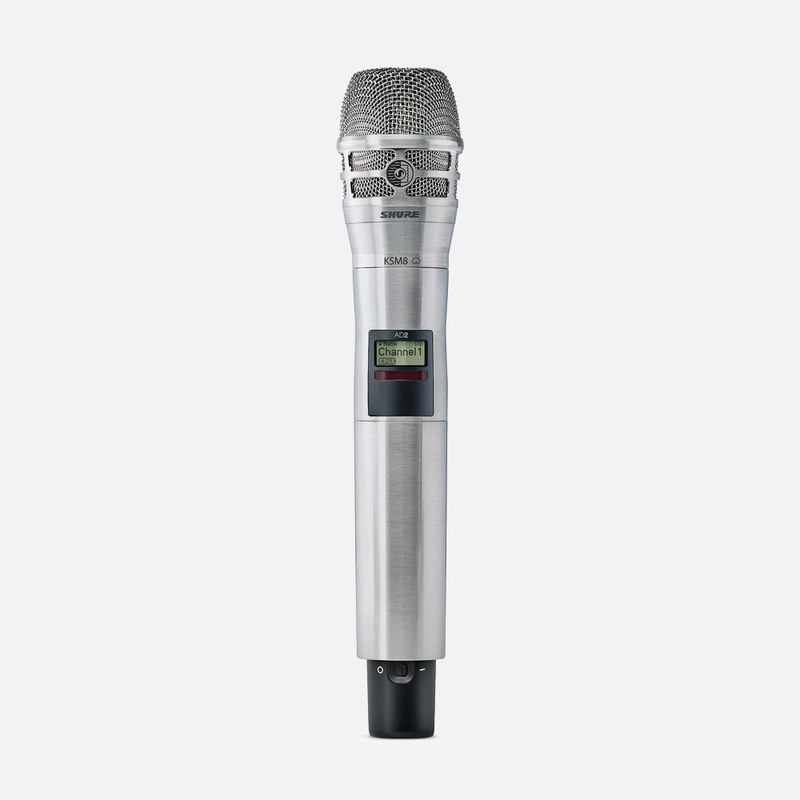 Made from magnesium alloy, the AD1 belt pack transmitter has many of the features the AD2 handheld transmitters offer, but has a detachable quarter-wave antenna and either a 4-pin TA4 or LEMO3 input connector for compatible microphones. It offers external charging contacts for docking and charging with optional SBC200 or SBC800 battery charger. The Shure AD1 is shipped without battery however is compatible with SB900-A or can use 2x AA alkaline batteries. AD1 TA4F: With TA4 connector. AD1 LEMO3: With LEMO3 connector. This is a 1U rack-mounting, battery-docking station for up to four optional SBC-AX caddies, each capable of charging two SB900-A Lithium-Ion batteries. Batteries can be charged to 50 percent capacity within one hour and full capacity can be reached within three hours. A front panel display shows the state of charge for any inserted battery as well as estimated time until full charge in hours and minutes, percent of capacity display, or battery-health metrics including cycle count and percentage of original capacity. The rear panel hosts a single AC power input with latching rocker power switch. Also on the rear panel is a RJ45 Ethernet socket to connect to a network and thereby adding the ability to use Shure Wireless Workbench software to monitor it remotely. Weight: 4.4kg. Dimensions (HxWxD): 44 x 483 x 366mm. Included accessories: IEC AC power cable, 3 foot Ethernet cable, rack mount hardware kit, 8x mounting screws for optional charger modules. 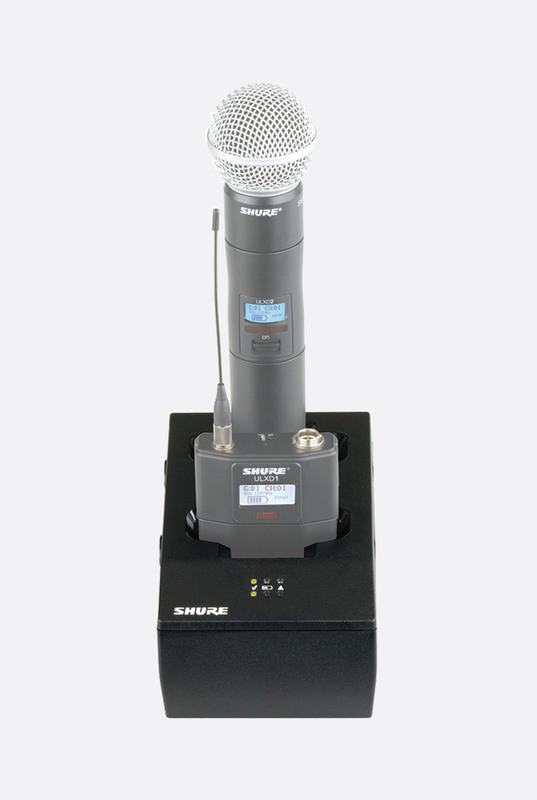 Shure SBC-AX is a charging module compatible with the SBRC-UK battery docking station. It has the capacity to take two SB900-A rechargeable Lithium-Ion batteries. Product only available for shipping to GB mainland addresses.